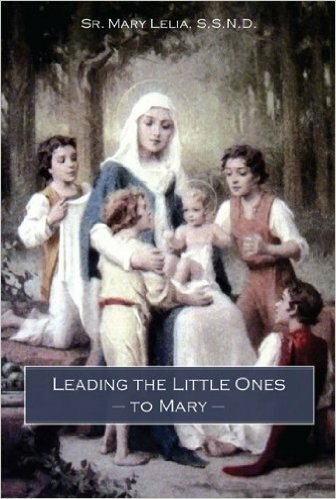 "An Indispensable Book For Your Children's Upbringing: Leading The Little Ones To Mary"
Leading the Little Ones To Mary has been an indispensable book to our children's spiritual development. It has been a great help in preparing them for their First Holy Communion and has served as a foundation for their interior life. It has also been an aid in character training. How often do you hear that about a book written for children! This book is written in sections that are called talks. It is written in a conversation format which makes it engaging for the child and makes it a cinch for the mother and father. There is much more to this book than what meets the eyes. A recommended books section concludes each chapter making this a treasure trove of Marian spirituality. This little book builds the foundation of a lifelong devotion to Mary as the means of attaining our eternal goal, Heaven. We have read it aloud during homeschool for many years. The older children often stop what they are doing to listen to the "talk". This book really is a beautiful support and encouragement for even older children. Oftentimes I have thought that if all Catholics had the faith and basic understanding that a First Communicant is expected to have, we would convert the world. Besides the de Montfort spiritual foundation, this book serves as a method to reinforce manners and obedience. Little Marys and Marios behave like Mary. With slogans and sacramentals as reminders, your family's code of conduct will be fortified with this simple book. "Mary did all things with a smile." "Mary did the better thing." "Mary was a good listener." "Mary always said yes, yes." The sacramentals encouraged are the miraculous medal and the brown scapular. Many other devotions are aroused in the hearts of children starting with the Rosary, encompassing Fatima devotions and Our Lady of Guadalupe, and ending with Our Lady of Good Counsel. I can't say enough about Leading the Little Ones to Mary. You must buy this book for your children, grandchildren, Godchildren and any children that you love. It is truly indispensable and every Catholic home should have one. What do you love about this book? We want to hear from you.